Air Purification Units (APUs) are re-locatable units based on the concept of a living wall to reduce air pollution. 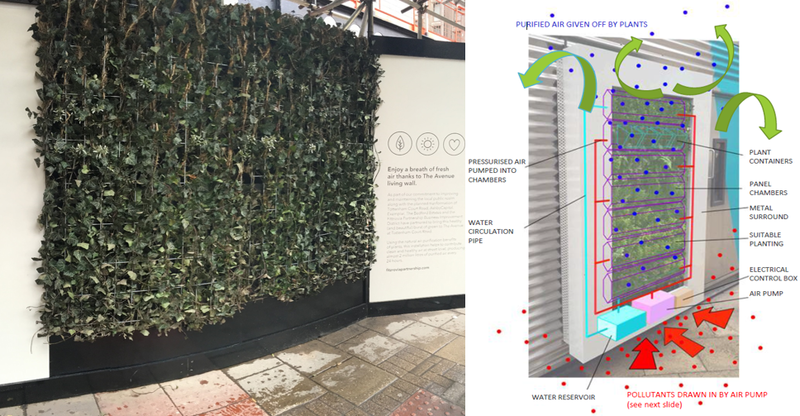 Partnering with Treebox, these have been integrated into the external hoarding of a Mace project site located on a road with some of London’s highest pollution levels. The system capitalises on natural air purification benefits of plants and microbes enhanced with ‘active living wall technology’. Quiet air pumps direct airflow through microbes in the substrate, and through a process of phytoremediation they are able to remove greater amounts of pollutants with more efficiency than passive greening. The APU purifies hazardous air pollutants such as NO2 and PMs 2.5 & 10, and can filter 500,000 litres of air per day. To find out more about these units click below.